They do make a statement that the reports from which I obtained my information (Form 1023) “were provided in discovery to the 26 defendants being prosecuted in United States v. Bundy, et al.” We clearly see that some of the people in the US Shyster’s office and some in the Court were also provided copies of those reports. However, they tend to be suggestive (subjective) rather than objective (what should be “the whole truth”), they conveniently omit any source that may have provided the information to me. Obviously, to do so would not fit their narrative. Then, regarding the Cease and Desist Letter of January 5, 2017, they state, “The letter requested Hunt to cease and desist from publicly disseminating the material. The letter also directed Hunt to remove the protected material from his website.” Well, close, but no prize. For example, the Letter said, “you must immediately, cease and desist”. Not quite a request, rather, a demand. When they said that it must be removed from my website, they conveniently omitted “or any other website”. The former would be a rather simple task; the latter, clearly impossible. 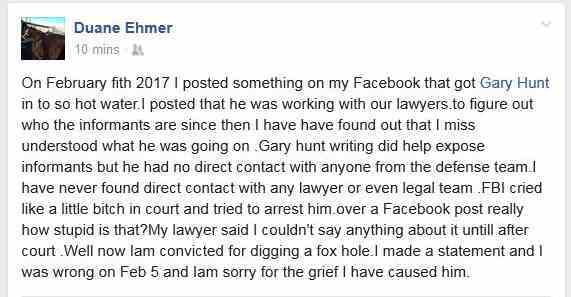 In referring to a comment made on Facebook, by Duane Ehmer, one of the defendants, they repeat that Duane has said, back on February 5, 2017, that in response to a question, he replied, “He is working with our lawyers”. As I have pointed out, previously, the answer was posted 17 minutes before the question, “Who is Gary Hunt?”, was asked. However, now there is more to this “Clear and Convincing Evidence”. We will get to that, shortly. The government has presented unrefuted clear and convincing evidence through sworn Affidavits of Special Agent Walker and Special Agent Kruger that prove Hunt is continuing to violate this Court’s Orders. Accordingly, at the March 10, 2017, hearing the United States will ask this Court to find that there is clear and convincing evidence that third-party Hunt should be held in civil contempt and issue a warrant for his arrest to be served by the United States Marshal. I suppose that they have taken a concept from history, that if you repeat something often enough, some will accept it as the truth. That then, should make everything valid evidence, regardless of the truthfulness of it. You will note that two Special Agents were named. “Walker”, being Ronnie Walker that filed the two previous affidavits, and Jason P. Kruger, who filed this Affidavit. It is only the current Affidavit that we will now discuss. 8. On March 9, 2016, Judge Brown entered an Interim Protective Order, court record #288, which stated that defense counsel may provide copies of discovery only to individuals further described in the Order. 9. On March 24, 2016, Judge Brown entered the final Protective Order, court record #342, which stated defense counsel may provide copies of discovery only to: 1) the defendants in this case; 2) persons employed by the attorney of record who are necessary to assist counsel of record in preparation for trial or other proceedings in this case; and 3) persons who defense counsel deems necessary to further legitimate investigations and preparations of this case. Now, the government is contending that I “aided and abetted” someone, though the have yet to identify just who it was that I “aided and abetted”. However, with that in mind, it would appear that they are trying to project me into those who are identified there, probably in the third listed identifications. Thus, it becomes extremely important for the government to rely upon the statement made by Duane Ehmer, on Facebook. Now, I have written a number of articles in the two series, “Burns Chronicles” and “Freedom of the Press” There is no doubt that the shysters are reading the articles, since they have referred to them numerous times in their numerous submissions to the Court, endeavoring to create an illusion that I am what they are trying to make me out to be. So, let’s look at what Ehmer has to say, now. He has been given permission by his attorney to clarify his statement, as explained in this posting made on Sunday, March 12, 2017, at about 10:23 am PDT. However, the government and FBI, having repeated their claim as to the significance of a Facebook post so often, we could expect that the Judge will buy their lie, instead of the truth. The Affidavit also provides a number of quotes from the radio show of March 2. I suppose they want to demonstrate what to them might appear to be belligerence on my part. From my point of view, I am simply stating a fact, that I am not subject to the Court’s jurisdiction, in this current matter, and that I will not be duped into submitting to that jurisdiction by making any appearance. However, while we are discussing the FBI, let’s look a bit into their investigative skills. These are the people that, in a two month period were able to produce a Criminal Complaint charging 26 people with felony crimes. In the next eight months, they were able to put together a case that went to trial, resulting in the acquittal of the Group 1 defendants. However, in over a year, they have been unable to figure out which FBI HRT team members fired two shots on January 26, 2016, and then covered up the fact that they fired those shots. Those two shots were, without a doubt, part and parcel to the murder of LaVoy Finicum, on that date. A real crime, not the manufactured appearance of a crime. By the Affidavit, we see that they have, through specialized use of their superior investigative skills, found a Facebook post and a radio show. That is all the evidence they have provided to create that which isn’t. They have not interviewed me, though I have explained my position to Special Agent Catalano, as was well explained in a few of the “Freedom of the Press” articles. They haven’t incorporated what I have stated, regarding both case law and factual arguments, along with any other material that should be considered in an objective investigation. After all, it would prove “exculpatory” in the current situation. Instead, we can see that truth is not the objective of the government. An objective investigation would provide all of the truth, not just those meager pieces made of “whole cloth”, by what Walker and Kruger have put together in an effort to, and I will say it, loud and clear, frame me. I can understand the US Shysters, seeing this as adversarial, want to “find dirt”, to justify the exclusion of facts that don’t suit their objective. Heck, we have seen that through the last two Malheur trials — every effort to exclude that which might dispute, or interfere with, their desire for a conviction, or in my case, to be incarcerate for “contempt of court”. 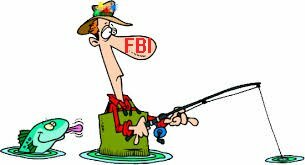 The FBI, however, is not a private tool of the US Shysters. It is supposed to be a part of a functional government, whose purpose is to serve its creator, the People. When those powers become so misdirected, as they have in this instance, we can easily see that the government has decided to serve itself, not the People — that, in fact, we have become subject to a police state, every bit the same as the old U.S.S.R., East Germany, and Hitler’s Third Reich. Posted in Editorial, Gary Hunt, Maulher.